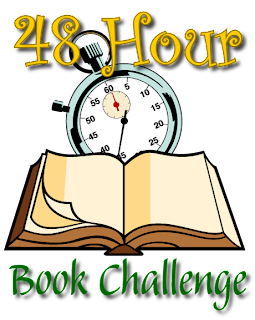 Hard to believe, but we're up to the Tenth Annual 48 Hour Book Challenge, and with year ten, we're going back to basics. While I have loved past experiences of reading for RIF and in solidarity with WeNeedDiverseBooks, this time it's a simple weekend, bookish, get-together. While some will skip sleeping for the readathon, only twelve hours are needed to be an official participant of the 48HBC. So, you can do this. The rules below are to help both you (how does this work again?) and me (please link to your blog or I can't find you!). It's all on the honor system and it's all for fun. The weekend is June 19th-21st, 2015. Read and review for any 48-hour period within the Friday-to-Sunday window. Start no sooner than 7:00 a.m. on Friday the ninetieth and end no later than midnight Sunday the twenty-first. So, go from 7:00 a.m. Friday to 7:00 a.m. on Sunday... or maybe 11:00 p.m. Friday to 11:00 p.m. Sunday works better for you. But once begun, the 48 hours do need to be in a row. That said, during that 48-hour period you may still have gaps of time in which you don't read or chose to sleep, and that’s totally fine. Three winners will be chosen at random from each of three levels of reading commitment - 12 to 23 hours, 24 to 35 hours, and 36 to 48 hours. Since each level will progressively have less participants, the more you read the better your chances. Top readers will win individual prizes. International winners may be given gift cards instead of books due to mailing costs, unless a U.S. address is provided. The books can be graphic novels, middle-grade, young adult, or adult books. One audiobook can also be included in your time and book total — helpful if you have somewhere to drive to or need to prepare dinner, etc. You are welcome to include some networking time reading and commenting on other participant’s blogs, sharing on Facebook, and Tweeting about your progress (remember the #48hbc tag!). When you begin, sign in at the "Starting Line" post at MotherReader on June 19th. When you finish, check in at the "Finish Line" post at MotherReader on June 21st. At the end, write a final summary that clearly indicates hours — including partial hours — you spent reading/reviewing/networking, the number of books read, and any other comments you want to make on the experience. To be counted, it needs to be posted no later than noon EST on Monday, June 22th. I’m always looking for donations for winners’ prize packages and other “door prizes” to be awarded to participants selected at random. Past prizes have included original sketches from illustrators, loads of signed books, t-shirts from Threadless, artistic blank journals, jewelry, gift cards, notecards, and more. Good stuff. If you’d like to contribute to the prizes this year, shoot me an email at MotherReader AT gmail DOT com. Sign up now in the comments and block the dates on your calendar. Questions can also go in the comments, and I will respond in the comments and add a FAQ soon. Let's have some reading fun! What better way to come back to blogging from my accidental sabbatical than by announcing the dates for the Tenth Annual 48 Hour Book Challenge! We're going a touch later in the month of June than in previous years, but still before the ALA Conference. Hopefully everyone will be done with school and ready to relax with a bit - or a lot - of reading. It will be a low-key affair, but even the most casual of gatherings needs some established rules - that's why we don't double-dip our chips at parties - so those will go up on Monday. If you are too excited to wait, they will look remarkably similar to these. Yeah. You can feel the energy. Check back for the details.